What is a Milgrain ring? Milgrain designs are usually a feature of antique jewelry, but modern jewelers have started to incorporate this design into their collections as well. 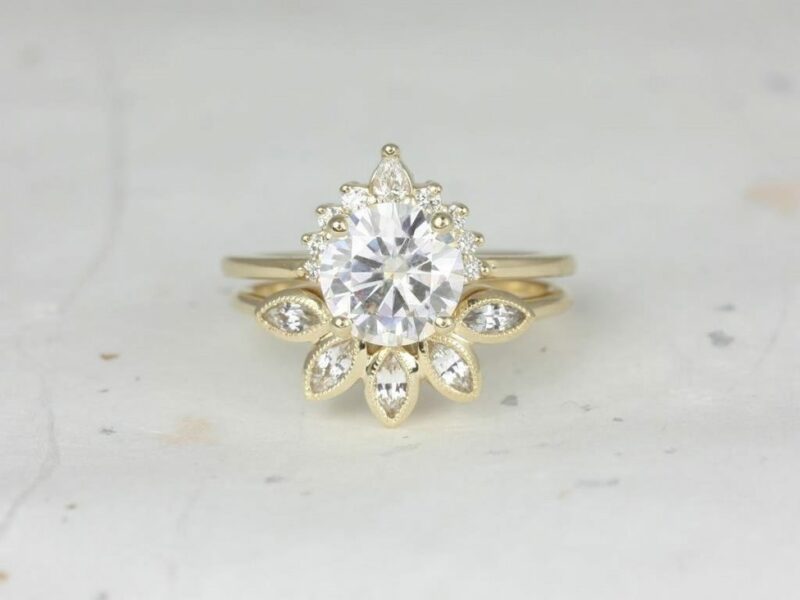 Jewelers incorporate milgrain into rings to recreate a more authentic vintage look. Milgrain is distinguished by intricate, engraved features. Jewelers may solder beads on, or have beads pre-set into the ring mold to achieve the Milgrain effect. 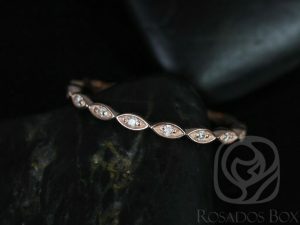 The band featured below is the Rosados Box Ultra Petite Leah 14kt Rose Gold Vintage with Milgrain, and on the right, without the milgrain design. As you may notice, milgrain can add much more detail, while without it, the band has a more smoothed out edge. Due to the extra time and attention that milgrain designs demand, rings with milgrain may have a higher premium. Because of the art deco, vintage look that milgrain creates, it has become a sought-after feature in many wedding rings and eternity rings. The Rosados Box Mae 1.53cts & Christie 14kt Rose Gold Peach Champagne Sapphire and Diamond Halo Wedding Set is just one of our many wedding rings that feature a classic milgrain design. The diamond quality features a G in color and SI in clarity. Visit our Instagram post to see a video of the ring being worn. Looking for something slightly more stylized? Check out the Rosados Box Kylie 8mm & Petunia 14kt Yellow Gold Round F1- Moissanite Diamonds Sapphire Crescent Leaves Wedding Set. This look exhibits a fun, floral design while maintaining simplicity and elegance. 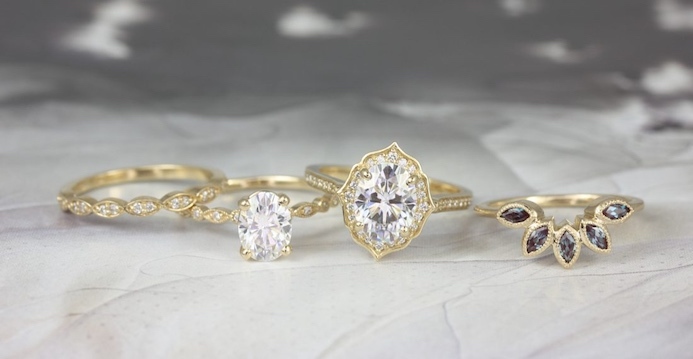 Pear-shaped gems have surged in popularity as of late. Take a look at our Rosados Box Tabitha 8x6mm & Christie Band 14kt Rose Gold Pear Morganite and Diamonds Halo Wedding Set. While the main design is simple, the detail of the milgrain brings out the shine and cut of the gem. Visit our page of wedding rings to find other elegant ring designs (with or without milgrain) for your special day. Plan on making a promise to someone? Do it with style! Milgrain engagement rings are just as popular as wedding bands- there’s just something about that classic edge finish that makes it appealing for the most special occasions. 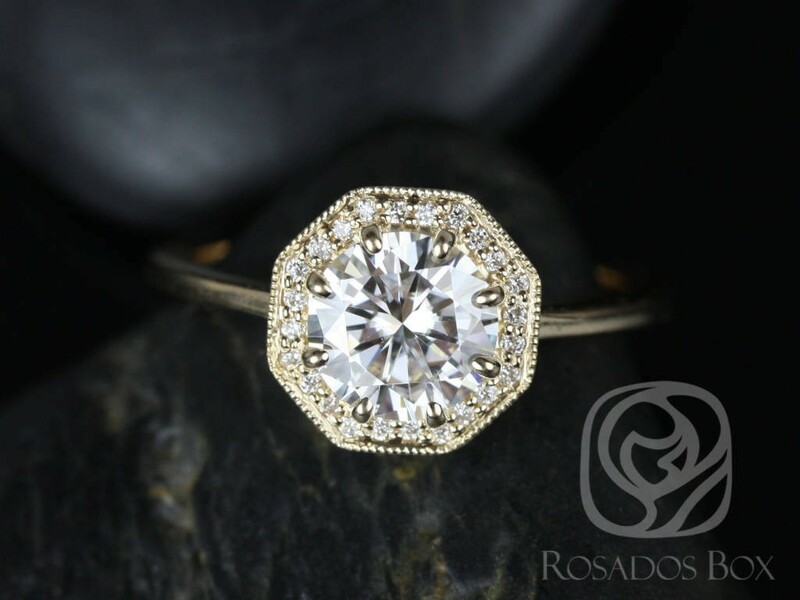 The Rosados Box Winona 7mm 14kt Yellow Gold Round F1- Moissanite and Diamonds Octagon Halo WITH Milgrain Engagement Ring combines the milgrain and halo designs together, featuring authentic Forever One GHI Moissanite by Charles & Colvard. Your special other will particularly like this ring for the level of detail on the edge and surface. For a twist on a similar design, the Rosados Box Christie 3/4ct 14kt White Gold Round Diamond Cushion Halo WITH Milgrain Engagement Ring offers a round cut design with a cushion halo. 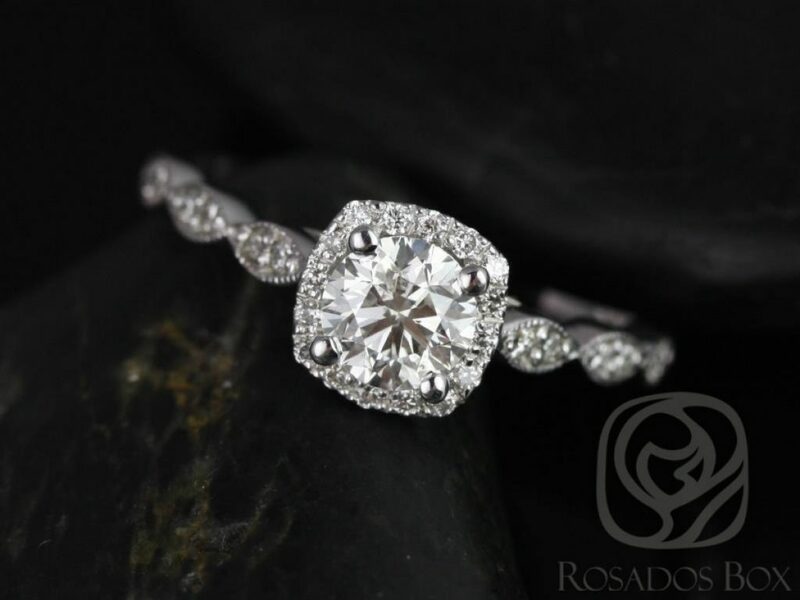 The center stone is a natural, untreated, conflict-free diamond with a crystal clear color. 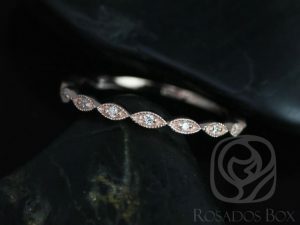 Finally, there’s the Rosados Box Mae 8x6mm 14kt White Gold Oval F1- Moissanite and Diamond Halo WITH Milgrain Engagement Ring. This design features a classic, smoothed band, with a unique gem shape. The stone is an authentic Forever One GHI Moissanite by Charles and Colvard that even comes with an Authenticity Card. 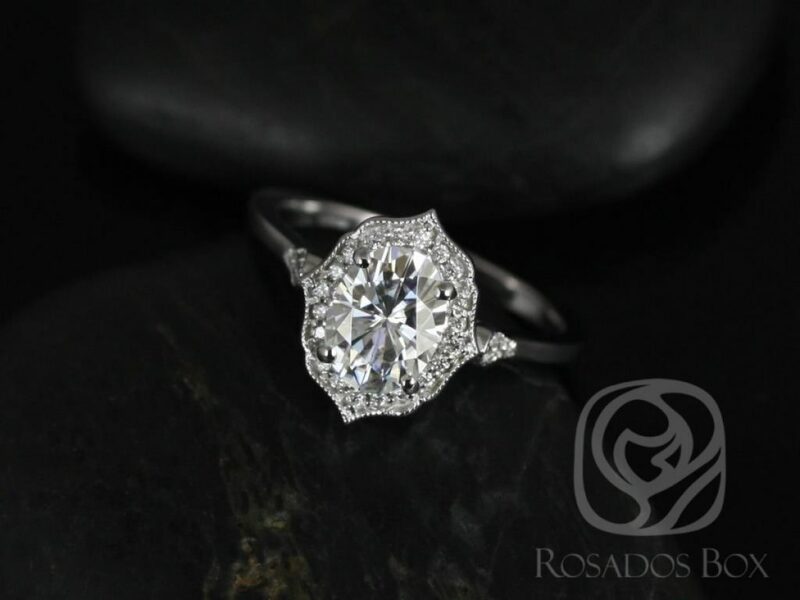 A memorable engagement ring for a memorable moment. 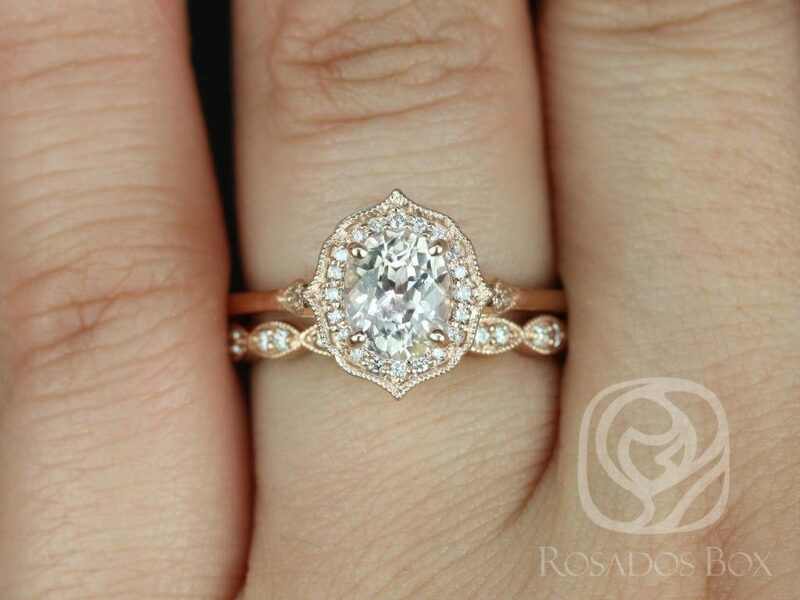 Want to explore our collection of handcrafted engagement rings? Visit our engagement rings page today. Milgrain has remained a popular feature in many rings around the world. The unique, immediately recognizable style has even become an expected element for many looking to buy their engagement or wedding rings. No matter which design you choose, milgrain can certainly help bring out the purity of the gem, and add to the intricacy of the band. Visit Love & Promise Jewelers to see our handcrafted collections, and visit our blog for other guides and resources on all things gems and jewelry.